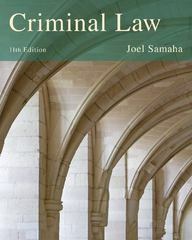 Criminal Law 11 Edition Clear, concise, and cutting edge, Joel Samaha's best-selling CRIMINAL LAW, 11th Edition helps you apply criminal law's enduring foundations and principles to fascinating court cases and specific crimes. With a balanced blend of case excerpts and author commentary, the author guides you as you sharpen your critical thinking and legal analysis skills. As you progress through the book, you'll learn about the general principles of criminal liability and its defenses, as well as the elements of crimes against persons, property, society, and the state. You'll also see these principles at work in the cases and crimes that illustrate them. Available with InfoTrac Student Collections http://gocengage.com/infotrac.